The first time I saw Jacques Tati's “Mr. Hulot's Holiday,” I didn't laugh as much as I thought I was supposed to. But I didn't forget the film, and I saw it again in a film class, and then bought the laserdisc and saw it a third and fourth time, and by then it had become part of my treasure. But I still didn't laugh as much as I thought I was supposed to, and now I think I understand why. It is not a comedy of hilarity but a comedy of memory, nostalgia, fondness and good cheer. There are some real laughs in it, but “Mr. 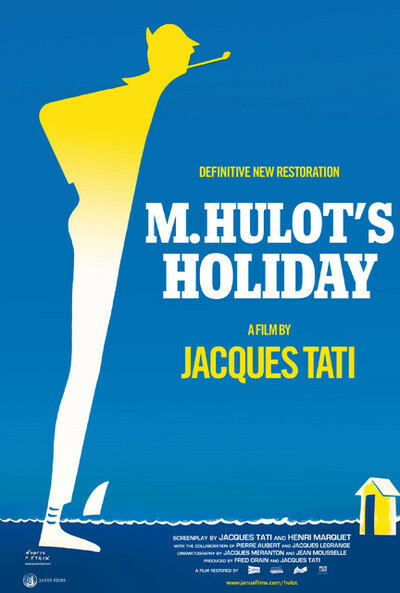 Hulot's Holiday” gives us something rarer, an amused affection for human nature--so odd, so valuable, so particular. The movie was released in 1953, and played for months, even years, in art cinemas. “Mr. Hulot” was as big a hit in its time as “Like Water for Chocolate,” “The Gods Must Be Crazy” and other small films that people recommend to each other. There was a time when any art theater could do a week's good business just by booking “Hulot.” Jacques Tati (1908-1982) made only four more features in the next 20 years, much labored over, much admired, but this is the film for which he'll be remembered. Hulot, decked out in holiday gear and smoking a pipe, is friendly to a fault, but he is the man nobody quite sees. The holiday-makers are distracted by their own worlds, companions and plans, and notice Hulot only when something goes wrong, as it often does. The lobby of his seaside hotel, for example, is an island of calm until he leaves the door open, so that the wind can create a series of small but amusing annoyances that must have taken days to set up. Others are busy beavering away at being themselves. There is a waiter who cannot believe the trouble people put him to. An old couple who think they have been assigned to inspect everything in their path. A retired general, easily offended. Small children who are protected by the god of children, so their ice cream cone seems certain to spill but never quite does. “Mr. Hulot's Holiday” is a French film, with hardly any words in it. It plays as a silent film with music (a lilting, repetitive melody), a lot of sound effects and half-heard voices. Tati was a silent clown; he worked as a mime as a young man, and his Hulot seems to lack the knack of getting into a conversation. The movie is constructed with the meticulous attention to detail of a Keaton or Chaplin. Sight gags are set up with such patience that they seem to expose hidden functions in the clockwork of the universe. Consider the scene where Hulot is painting his kayak, and the tide carries the paint can out to sea and then floats it in again, perfectly timed, when his brush is ready for it again. How was this scene done? Is it a trick, or did Tati actually experiment with tides and cans until he got it right? Is it “funny”? No, it is miraculous. The sea is indifferent to painters, but nevertheless provides the can when it is needed, and life goes on, and the boat gets painted. And then consider Tati when he goes out paddling in his tiny kayak, which like his car is the wrong size for him. It capsizes. In another comedy, that would mean the hero gets wet, and we're supposed to laugh. Not here; the boat folds up in just such a way that it looks like a shark, and there is a panic on the beach. Hulot remains oblivious. There is an almost spiritual acceptance in his behavior; nothing goes as planned, but nothing surprises him. Not only sights but sounds have a will of their own in Tati's universe. Listen to the thwanking sound made by the door in the hotel dining room. Does it annoy Hulot, who has been placed in the Lonely Guy table near to it? Probably, but it is in the nature of the door to thwank, and we sense that it has thwanked for a generation, and will thwank until the day the little clapboard hotel is torn down to put up a beachfront gargantoplex. Let me try to explain my relationship with “Hulot.” The first time I saw it, I expected something along the lines of a Hollywood screwball comedy. Instead, the movie opens with its sweet little melody, which is quite pleased that life goes on. Hulot arrives (inconveniencing a dog that wants to sleep in the road) and tries his best to be a well-behaved holiday-maker. He is so polite that when the announcer on the hotel's radio says “Good night, everybody!” he bows and doffs his hat. Because there were no closeups, because the movie did not insist on exactly who Hulot was, he became the audience--he was me. I met all the people Hulot met, I became accustomed to their daily perambulations as he did, and I accompanied him as he blundered into a funeral and was mistaken as a mourner, and when he was accosted by a rug, and when a towrope boinged him into the sea. And then the holiday was over, and everyone began to pack and leave, and there was the hint of how lonely this coastal village would be until next summer, when exactly the same people would return to do exactly the same things. When I saw the film a second time, the wonderful thing was, it was like returning to the hotel. It wasn't like I was seeing the film again; it was like I was recognizing the people from last year. There's the old couple again (good, they made it through another year). The waiter (where does he work in the winter?). And the blond girl (still no man in her life; maybe this is the summer that . . .). When has a film so subtly and yet so completely captured nostalgia for past happiness? The movie is about the simplest of human pleasures: The desire to get away for a few days, to play instead of work, to breathe in the sea air, and maybe meet someone nice. It is about the hope that underlies all vacations, and the sadness that ends them. And it is amused, too, that we go about our days so intently, while the sea and the sky go about theirs.